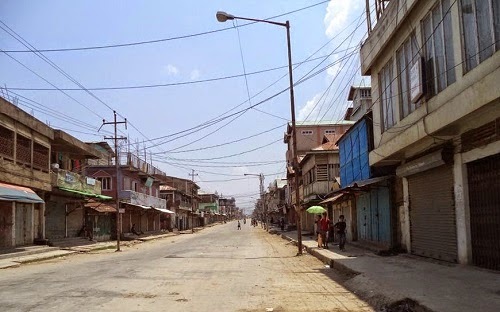 CCPur, August 21, 2014 (HT) : All Tribal Students Union Manipur (ATSUM) in zani zanril-a inthawka Manipur Hill Districts pumpuia Bandh an thaw chu an thlawp ding thu Kuki Students’ Organisation(KSO) chun zani zantieng 2:30PM-a tuolsung chanchinbu reporter-hai an inhmupui huna an hril. Bandh hin Medical le Press/Media ti lo chu a huom vawng ding niin T. Lalkhohao Haokip, President, KSO-CCPru chun a hril. Jiribam-a Primary Teacher post lakna ding thuah district dang han an inhni theinaw bakah ST Reservation (31%) quota khawm sawrkarin a ngaisak nawh tiin Mr Haokip chun a hril. ST Reservation chungthua ATSUM in zani zanril- a inthawk Manipur Hill Districts haia Bandh an thaw hi Hmar Students Associationa (HSA) CCPur Jt. Hqrts khawmin an thlawp thu zanita thusuok an siema chun an zieklang a.
HSA huomsunga um Government le Private/ Mission Institutions hai chu khar seng dingin an ngen bakah Tribal issue a ni leiin mipui hai thlawp seng dingin an ngen bawk.